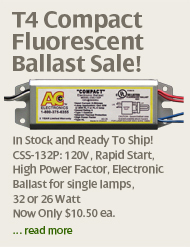 Use the "Product Finder" for assistance in selecting the correct replacement ballast for your application. Most lamps will have the lamp type and wattage stamped on the end of the tube or on the lamp base. For straight tubes, the type and wattage can also be determined by measuring the tube. We recommend that you have the existing ballast and one of the lamps from the fixture handy as you proceed. If you need to determine the wattage of a straight-tube flourescent lamp, you will also need a tape measure. Need help? View photos of common lamp types!